We’re big on using videos to tell our story, share new features and provide training information. 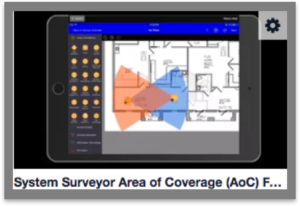 Quick tour video: Watch a short overview video about System Surveyor. CEO Video: Christopher Hugman, P.E. shares his vision on how digital tools will transform system integration for the better. ISC West 2018 Recap & User Panel: See our high-energy video from ISC West in Las Vegas and what our session user panelists had to say about using System Surveyor! Customer Video: Featuring customers sharing their experience with System Surveyor and how it’s fostering engagement between integrators and end users. Concept video: Watch a 2 minute animation video covering why we created System Surveyor in the first place! Getting Started with System Surveyor: Welcome to System Surveyor! Need a few tips to help you get started? This Getting Started video will walk you through your first encounter with System Surveyor. Learn how to navigate your account, your workbench, and your profile settings by watching this short video. Creating a Site and Survey: Off to a good start with the System Surveyor app, but wanting a few more pointers? This short video was created to teach you how to create sites on the app. Learn how to navigate your site dashboard and begin working on a survey! Working on a Site and Survey: Making great progress with the System Surveyor app, but needing some guidance? This 5-minute video was created to teach you how to add elements to and edit surveys on the app. Learn how each element works and the attributes and photo annotations involved when adding elements to a survey. Overview, Projects and Reports: When it is time to do more reporting on each of your projects, this video will provide guidance on important how-to’s and tips and tricks. Area of Coverage: Used to show coverage areas for cameras, motion detectors and other devices. Users can now adjust the direction, angle and even depth of the Area of Coverage with touch and drag gestures. The numeric depth and angle of the AoC is automatically calculated based upon the survey scale.